Factory-Line Power Supply System consists of a trunk line duct for 400A, 200A, 100A, and60A units, and branchedline ducts for 30A and 20A units. 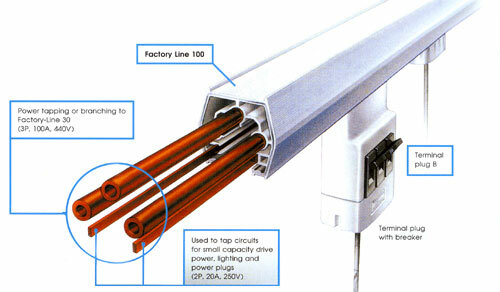 Power can be supplied from anywhere on the line by installing removable power plugs on the ducts. This allows flexible and low-cost layout alterations andadditions. 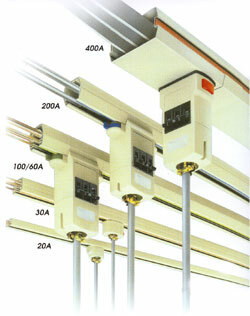 Select the appropriate system depending on the scale of the factory (400A, 200A, 100A, 60A, 30A, and 20A units available). Simplifies piping work and minimizes cable lengths. Both safety and appearance are improved.